Sole di Sari is a four-star camping site that focuses on delivering an outstanding holiday experience in luxurious accommodation and in spectacular surroundings. 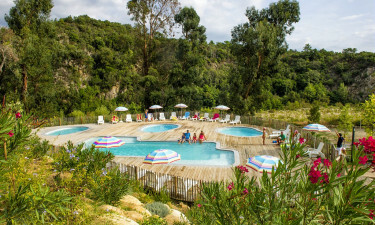 This luxury campsite is ideally located in the south of Corsica and offers easy access to beaches, mountain villages, and countless opportunities to relax under the sun. 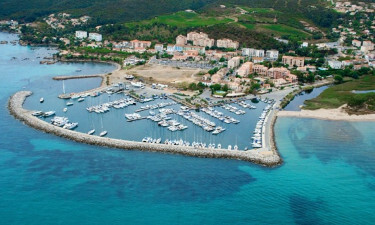 Book your perfect camping holiday in Corsica with Lux-Camp and you will never go back to traditional camping. To help you get the most enjoyment out of your luxury camping holiday, Sole di Sari offers accommodation in spacious and well-appointed mobile home units. These are beautifully built using natural materials and can accommodate up to 6 people. Guests can choose among 2 and 3-bedroom mobile homes that boast dedicated cooking and living space, a private terrace, and kitchen equipment. Sole di Sari guarantees camping luxury with its fantastic range of amenities. To make your stay truly comfortable, the campsite offers modern conveniences like a laundry room, Internet terminals, shops selling snacks and daily newspapers, swimming pools for adults and children, a Jacuzzi, and a fitness centre. Sole di Sari also has a kids' playground and dedicated entertainment programmes for children, as well as thematic evenings, sports facilities, and more. Sole di Sari is located by the Solenzana River, where virtually unspoilt natural landscapes are within minutes of your luxury tent or bungalow. The campsite is also on the spectacular Route de Bavella, a 112-km long road that has been listed as one of the top drives in the Mediterranean. A pristine beach is 1km away, and the Cote des Nacres offers a chance to practice watersports like surfing and diving. Nearby, the Bavella mountains are perfect for hiking, rock climbing, and cycling. Sole di Sari's on-site restaurant serves locally sourced produce and is open for breakfast and dinner. This delightful venue has an open-air setting and offers live entertainment and a convivial atmosphere. The campsite also has a bar and an ice cream parlour. The campsite has a fully equipped supermarket where guests can shop for groceries and holiday essentials. Other shops and boutiques can be found in the village of Sari-Solenzara, which is 1km away.